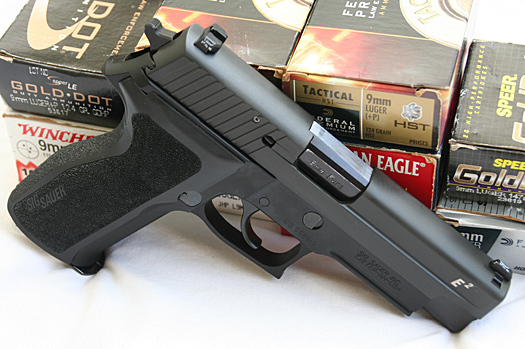 The Sig Sauer P226 E2 was one of the more understated new guns announced at the 2010 SHOT Show. A refinement of the P226 line, the new E2 had new ergonomic characteristics that pushed it to the top of my “must review” list. The concept of the E2 pistols is fairly simple: take an established line of successful pistols and make them more shootable for a wider range of people. But with any fine machine, the details make the difference. Good news: the Sig Sauer P226 E2 is a winner. Sig Sauer’s enormously popular line of P226 pistols are large. The pistol was designed to be a full-size combat handgun for military and law enforcement forces of the world. The catalyst for the project was the pistol tests of the United States military seeking to replace the M1911-A1 handguns. Available first in 9mm, the P226 was later chambered in .40 S&W and .357 Sig. However, the size of the P226 frame was a problem for many shooters with small or even average size hands. The grip size will affect where the finger addresses the trigger. For someone like myself with “stubby finger syndrome,” the normal P226 is simply too large a frame for proper finger placement on the trigger. Minor modifications, such as the installation of a reduced reach trigger and aftermarket grip panels were the only real ways to adjust the size of the P226 to match the shooter. For some shooters, one or both of these modifications were enough to satisfy them. Neither completely solved my problems. Prior to the 2010 SHOT Show, I discovered that Sig would be showing a new pistol called the E2, which was designed to address the size of the frame on the P226 and P229 pistols. At the SHOT Show, one of the first booths I visited belonged to Sig Sauer. There I had the chance to handle one of the new E2 pistols. I was immediately blown away by how good this new Sig felt in my hand. I knew I had to test one of these as soon as I could. Eric vonBosse, a product manager for Sig Sauer, told me that his company received a lot of requests over the years to have a P226 that was designed for smaller hands. vonBosse said the E2 was the culmination of the research and design efforts of Sig engineers to meet that demand. So, what makes the E2 pistol special? Not much, yet everything. A quick glance at the pistol doesn’t reveal anything revolutionary. The backstrap of the pistol seems to be shaped slightly differently, but the pistol looks very similar to previous incarnations of the 226. So lets go over some of the differences so you don’t miss anything. First, the most visible change is the gun’s grip. The area high on the backstrap appears to have been cut away and sculpted to allow the web of the shooting hand to fit more naturally into the pistol. This allows someone with smaller hands to better address the trigger. The portion of the backstrap directly to the rear of the trigger was reduced by 0.15″, while the rest of the backstrap was reduced, with reductions ranging from 0.1″ to 0.2″. Sig also states the overall grip circumference is also reduced, but I do not have a specific amount of reduction. The new recess high on the backstrap also allows the hand to better mold with the gun, creating a feeling that the gun is an extension of your arm, not a tool in your hand. The old two-piece grip panels that screwed into the sides of the P226 have been replaced with a one piece grip that wraps around the back of the pistol. The new grip attaches like a spring-loaded clam shell, locking down onto the frame of the pistol. There are no external screws holding the new panels on the gun. If you are worried about the panels coming loose during firing, don’t. According to vonBosse, once the new panel snaps into place, it would take something akin to C4 explosives to remove them. Ok, I’m exaggerating a touch, but vonBosse did state it was virtually impossible for anything other than a Sig armorer to remove them. Another nice thing about the panels is the new, aggressive texture. The old grip panels were virtually smooth as compared to the new texture. When you grab the E2 P226, your hand ‘locks-in’, and you immediately feel like you have a lot more control over this gun. The texture is not so abrasive as to ruin any clothing, but you will definitely be able to hold onto this gun in the rain, mud, and blood. The reduced reach trigger is standard on the E2 pistols. The trigger puts the face of the trigger 0.4″ closer to the rear of the pistol without changing the trigger pull distance or weight. With the backstrap reduction described above, this puts the face of the trigger 0.55″ closer to the rear of the gun, making a big difference for folks with smaller hands. The decocking lever was slightly changed on the E2. 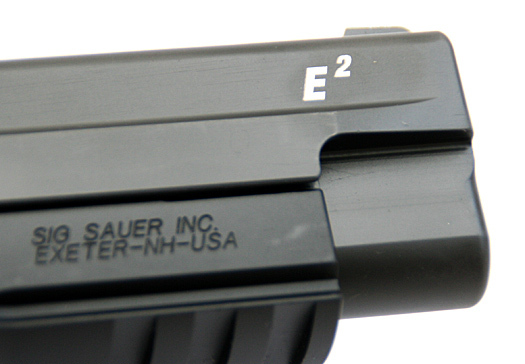 While it appears to work identically to the original P226, the face of the lever on the E2 is slightly smaller, not extending to the rear quite as much as the original. I’m not sure why this was done, or what improvements it is supposed to make, but it worked fine for me. Internally, I discovered that my pistol had a plastic recoil spring guide rod. I don’t know if this is now standard on all of the Sig pistols now, or if this is new to the E2. All of my prior Sig purchases had a metal guide rod. Also standard on the E2 pistols is the Short Reset Trigger (SRT). Sig claims the SRT reduces the trigger reset travel by about 60%, allowing faster follow-up shots. As many of you know, I am a full-time police officer in an urban area of Florida. My agency issues the Sig Sauer P226, so I took the pistol in to get the reactions of other folks carrying the 226 for a living. I shopped the pistol around to 25 different officers of varying sizes and genders, and the overwhelming majority really liked the E2. Exclamations like “Wow!” were not uncommon when someone picked the gun up for the first time. Only three officers expressed any real reservations about the new pistol. One officer thought the grip was too small. Interestingly, other officers with hands larger than his seemed to like the E2 better than the issued P226. Another officer thought the trigger was too heavy. This may simply be a function of smoothness from repeated use. Her pistol has been fired (and dry fired) thousands of times, creating a trigger than is extremely smooth. I would imagine few guns straight from the factory would match the smoothness of her duty pistol. The Sig P226 E2 was a huge hit, with most officers ready to swap their current pistols for the new E2. Ok, so all of the upgrades and enhanced ergonomics don’t mean anything is this gun don’t shoot. I’m very happy to say that the E2 does shoot…and shoot very well. The pistol I tested was chambered in 9mm, and was equipped with Sig’s night sights. The trigger system on my P226 was the traditional DA/SA. Accuracy with premium ammo was very good, and even cheap ammo made nice groups at 15 yards. The heavier bullets (147 grain) tended to produce the smallest groups, but the medium weight (115, 124 grain) bullets were still very accurate. All ammo would hit inside an 8″ plate at 15 yards without any difficulty. I am a stat junkie, and I know a lot of you are also. So I ran a lot of ammo through this pistol, and chronographed quite a bit of it. The P226 E2 has a 4.4″ barrel. For comparison, I ran the same ammo through a Glock 19 with a 4″ barrel. Chronograph set at about 10′ from the barrel. Average computed from a string of five shots. Including a few hundred rounds of 124 gr reloads from a local supplier, the Sig E2 only malfunctioned once, and that was a failure to extract on a Federal 115 grain +P+ JHP Hi Shok load. No other malfunctions happened. Shooting the E2 was a real joy. A full size gun like the Sig 226 can tame even the hottest 9mm loads. Adding the better grip size and texture made this gun very enjoyable to shoot. I spent an August afternoon shooting this pistol at an outdoor range in Florida. To suggest it was hot was an understatement. However, this provided an excellent test bed for the new grip texture. I was extremely pleased to discover that the aggressive grip texture was very effective at keeping the pistol from shifting in my hands, yet it was not abrasive on my hand. After about 400 rounds of ammunition, the pistol was still very comfortable to shoot. The Sig Sauer P226 E2 is an exceptional pistol. The ergonomic improvements make this handgun infinitely more shootable for people with small and medium sized hands. The fit and finish of the pistol is second to none, with high quality parts and machine work throughout. No aspect of the workmanship concerned me at all. The E2 pistol proved to be very reliable and accurate on the range. The ergonomics clearly added to my ability to manipulate the trigger and to control recoil. While I like the DAK-type trigger better than the traditional DA/SA of the P226, I would not hesitate to carry the E2 in defense of myself and others. The E2 may be ‘merely’ an evolution of an existing product line, but it is worthy of anyone needing a high-quality combat pistol. I recommend it without any reservations.